This week I picked up a book that’s been sitting on my shelf for a while. I think that I originally bought it because I was won over by the shiny picture of spilled coffee on the cover…oh and probably because of the topic too. 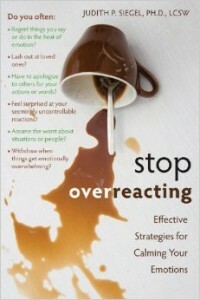 In all honesty, I haven’t seen too many books out there devoted specifically to overreactions. So it just made sense that I should actually take this book off my ‘To Be Read’ pile (which is enormous by the way) and finally give it a read. Stop Overreacting talks about an experience that we all encounter from time to time. Whether we’re the ones delivering the overreaction or the ones on the receiving end, overreactions can feel confusing in their impulsivity. This book spends a lot of time discussing triggers and devotes individual chapters to the four most commonly cited triggers: envy, rejection, criticism, and control. There are also sections looking at the challenges that overreacting can cause in the workplace and at home. Strategies for calming the emotions and (hopefully) halting overreactions can be found at the end of the book. In my opinion, this book was…ok. I mean it definitely had its pros and cons. It was simply written (pro), though it did not totally deliver on the promises of the title (con). I often tell my clients that ‘awareness is the first step,’ so of course it would be a big pro in my books that this book talks a lot about triggers and developing self-awareness. The exercises at the end of each chapter promote insight and honesty with oneself. However, I feel like the section about strategies to calm emotions was much too small (despite being referenced in the title of the book). Don’t get me wrong, there are some useful strategies that are discussed. It’s just that the discussion is unexpectedly brief. Also, though it was implied throughout the strategies section that readers should talk about deep issues with a professional, it was never explicitly stated. I would worry that readers may dive into analyzing their own past, get overwhelmed, and things would feel worse as a result. I see this book as a good starting point for anyone who wishes to understand overreactions a bit better, though I would recommend testing out the strategies with the assistance of a professional.